These sugar cookies covered in a soft gooey marshmallow coated in creamy dreamy chocolate are delicious. I had a hard time saving some for the family! I whipped up at batch of Red Velvet Sugar Cookie and cut out 2-inch circles with a cookie cutter. About two minutes before the cookies were done, I took the pan out and dropped a marshmallow on top. The marshmallow had been cut in half to make the cookie more uniform looking. I put the pan back into the oven for 2 minutes until the marshmallows were soft but not browned, then set them aside to cool. Then I simply coated the cookies in red, white, and green candy melts! Place candy and shortening into microwave safe container (I found that an old cottage cheese container worked the best!) and melt for one minute. Remove and stir, then place back in the microwave for 30-second increments. Once the chocolates are mostly melted, remove and stir to reach desired consistency. I wanted the chocolate pretty runny to make covering the cookies easier, so I added a bit more shortening. Just drop it in and stir into the heated chocolate until dissolved. You can find Amanda's Red Velvet Sugar Cookie Recipe here. If you want to add sprinkles, do so right after coating cookies in chocolate to ensure the sprinkles stick. 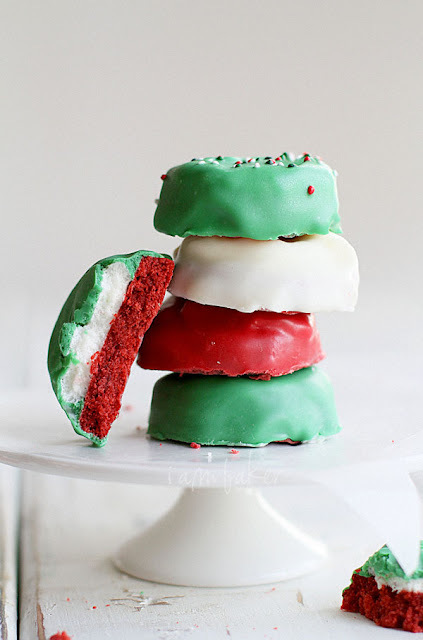 You can use my original Red Velvet Sugar Cookie recipe, or your favorite Sugar Cookie recipe and just add red food coloring. I used large marshmallows (not the extra large!) and just pushed them down a bit after heating to spread over the cookie. If you have any questions, please just leave a comment and I will be happy to assist! Thanks so much for letting me be a part of your event Katrina! I had the privilege of hanging out with Amanda this summer in Chicago as part of the Verizon Wireless Savvy Gourmet Bloggers when they gave us a Xyboard tablet and LG Intuition phone/tablet to play with. Let me just tell you that I made a total fool of myself. I mean as everyone else was paying attention to the speaker and learning how to use their devices I was busy taking pictures of Amanda’s sunglasses, people. True story. But for some reason she still likes me even though I professed my extreme blog crush on her again and again. She didn’t even make fun of me when I lost my rental car in the underground parking garage. Disclosure: I am participating in the Verizon Wireless Midwest Savvy Gourmets program and have been provided with a wireless device and six months of service in exchange for my honest opinions about the product. I was not compensated for a positive review. Thia is an awesome idea! Thanks Amanda and Katrina! These are gorgeous and sound so delicious! And way easier than I would've guessed. I can't wait to make them! These are so pretty and festive!!!! I can't wait to see all the cookies linked up! WOW! Awesome cookies!! These are my kinda treats… marshmallows and chocolate and red velvet… I might have entered Heaven! These are just so fun looking. I am not sure I would have cared what was inside but the fact that it is red velvet makes them even more amazing! Great cookies! Super festive, and pretty easy too. 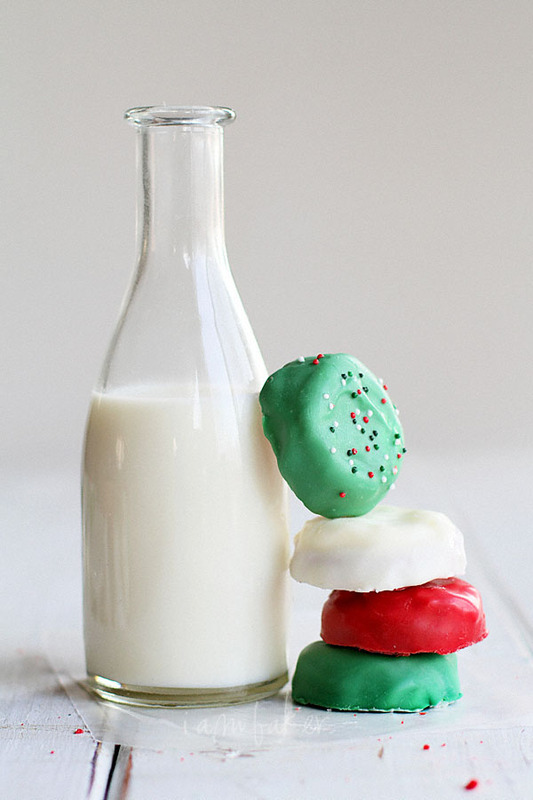 So glad that your Christmas cookie celebration has started! These are so creative and sound amazing! Yeah, these are most definitely awesome! Oh how I love marshmallow. And red velvet. And I Am Baker. Thanks, Katrina!! These are amazing! I love Red Velvet cake. I can only imagine that cookie form is 100X greater! 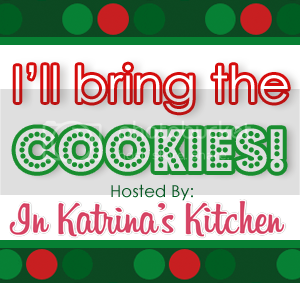 My recent post Brown Butter Brown Sugar M&M Cookies–Cookie Swap NYC! What a wonderful ice and so pretty to look at too! these look amazing and so much easier than I though. I can do them, yes I can! can't wait! ok, these sound fairly easy but was wondering if you dip the cookies in the chocolate or spoon over? Thanks!